Snap Frames : These snap frames feature enclosed bulletin boards! 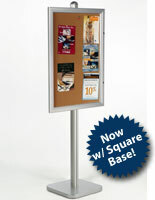 These enclosed bulletin boards are perfect in educational facilities and in the front lobbies of any type of business. 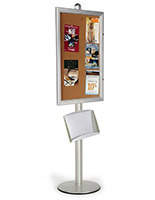 These bulletin boards are ideal for displaying promotional, informational and any other important materials. 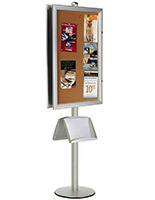 These enclosed bulletin boards, also known as floorstanding corkboards, are double sided. 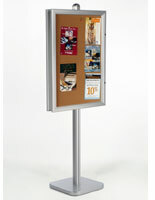 The floorstanding bulletin boards feature swing open, locking doors. To change your message simply unlock the door lock and swing the door open. Your messages are held in place by push pins or thumb tacks. The display surface is cork material. The center pole, weighted base and frame are constsructed from brushed aluminum. 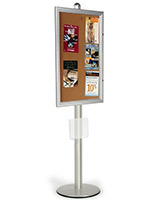 The corkboards, directory boards and other bulletin boards have an adjustable height. 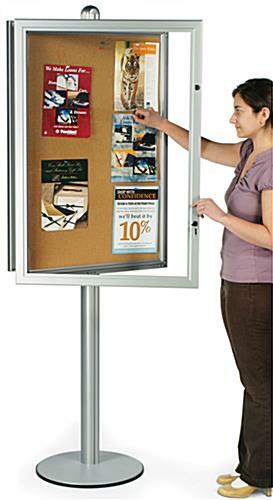 To change the height of your enclosed bulletin boards, loosen the connector bracket and slide the board to your desired height on the pole. Initial assembly consists of attaching the base to the pole and the cork boards to the pole. 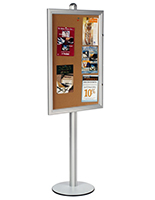 We provide these enclosed bulletin boards with push pins, a set of keys and hardware to attach the board to the pole. 26.1" x 76.0" x 17.5"